The Scan Cards App is one of the few apps that I like and will use (and have been using). Most apps are easy to reverse engineer and most of the time your spectators walk away from the trick thinking that it is a software trick and not being that impressed. This is different. First of all, this app enables you to perform two tricks. The first, and namesake, lets you scan, using your phone, face down cards in the deck. Basically, you hand your spectator a deck of cards after you shuffle it. You then allow the spectator to cut the deck as much as they want. When they decide to stop cutting the deck they can take the top 3 cards, or the bottom 3 card, or a mixture of bottom and top cards and place them face down into the deck, which is face up. The deck is then placed back into the box and the phone is placed on top of the tuck box. The Scan Cards application had been opened by the performer and a button “START THE SCAN” appears on the screen. 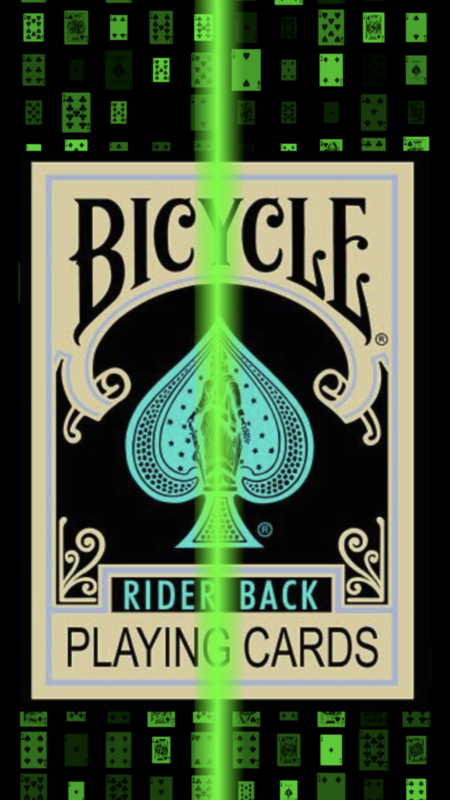 Instantly, an x-ray picture of the deck appears on the screen and it looks like it is being scanned by neon green lines tracing the face of the deck image. Then a button “RESULT” appears and once pressed, text appears that indicates that there are a certain number of cards face down (in this case 3). Those cards are displayed face down on the screen so you can see the card backs and when each one is touched they flip over displaying the specific card. When you take the deck out of the box and fan the deck to see the reversed cards, they match the cards displayed on the screen. The reveal cards can be different every time. A few things, you will need to use a very well-known method for performing card magic, but you don’t actually need to have a good memory. I am talking about a full deck stack (the use of which is revealed in the app store). Whether you don’t know a thing or are a Tamariz, Aronson, Osterlind, Aragon, Redford fan (or others), you are all set. The app will show you the deck order if you don’t know it. As far as the types of cards that you can use, the current selection are Phoenix, Tally-Ho or Bicycle decks in blue or red. There are other options as well. This is important so that when the deck is “scanned” the matching logo will appear. In addition to the scanned trick, there is a very clever Shuffle Bored trick. You can either have the app set to do the scan trick alone, Shuffle Bored alone or a combination of the two. There is a very user friendly explanation section of the app that brings you to a YouTube video. Overall, this app is very easy to learn how to use and very easy to perform. There are a couple of modifications that I think would make the app a bit more direct and, well, better. I am sure we will see some upgrades. The most important part of this trick is the spectator reactions. They are great. Like I said above, most of the time spectators feel that magic apps accomplish what they need to by software and are accordingly not that impressed. Here, that is not the case. The reactions I have received have been very strong – especially when I instantly repeated the trick and had accurate results with different cards. The cost of this app is $13.99 and you can use it anytime you travel with a deck of cards. It is a great trick to start or finish with a mem-deck, or use anytime at all. I highly recommend this app. The Scan Cards App is one of the few apps that I like and will use (and have been using). Most apps are easy to reverse engineer and most of the time your spectators walk away from the trick thinking that it is a software trick and not being that impressed. This is different. First of all, this app enables you to perform two tricks. The first, and namesake, lets you scan, using your phone, face down cards in the deck. Basically, you hand your spectator a deck of cards after you shuffle it. You then allow the spectator to cut the deck as much as they want. When they decide to stop cutting the deck they can take the top 3 cards, or the bottom 3 card, or a mixture of bottom and top cards and place them face down into the deck, which is face up. The deck is then placed back into the box and the phone is placed on top of the tuck box. The Scan Cards application had been opened by the performer and a button “START THE SCAN” appears on the screen. Instantly, an x-ray picture of the deck appears on the screen and it looks like it is being scanned by neon green lines tracing the face of the deck image. Then a button “RESULT” appears and once pressed, text appears that indicates that there are a certain number of cards face down (in this case 3). Those cards are displayed face down on the screen so you can see the card backs and when each one is touched they flip over displaying the specific card. When you take the deck out of the box and fan the deck to see the reversed cards, they match the cards displayed on the screen. The reveal cards can be different every time. A few things, you will need to use a very well-known method for performing card magic, but you don’t actually need to have a good memory. I am talking about a full deck stack (the use of which is revealed in the app store). Whether you don’t know a thing or are a Tamariz, Aronson, Osterlind, Aragon, Redford fan (or others), you are all set. The app will show you the deck order if you don’t know it. As far as the types of cards that you can use, the current selection are Phoenix, Tally-Ho or Bicycle decks in blue or red. There are other options as well. This is important so that when the deck is “scanned” the matching logo will appear. In addition to the scanned trick, there is a very clever Shuffle Bored trick. You can either have the app set to do the scan trick alone, Shuffle Bored alone or a combination of the two. There is a very user friendly explanation section of the app that brings you to a YouTube video. Overall, this app is very easy to learn how to use and very easy to perform. There are a couple of modifications that I think would make the app a bit more direct and, well, better. I am sure we will see some upgrades. The most important part of this trick is the spectator reactions. They are great. Like I said above, most of the time spectators feel that magic apps accomplish what they need to by software and are accordingly not that impressed. Here, that is not the case. The reactions I have received have been very strong – especially when I instantly repeated the trick and had accurate results with different cards. The cost of this app is $13.99 and you can use it anytime you travel with a deck of cards. It is a great trick to start or finish with a mem-deck, or use anytime at all. I highly recommend this app. Words Beyond (a book test) by The Other Brothers and Vanishing Inc.
One can put his OWN stack in the app when I understood it well ?